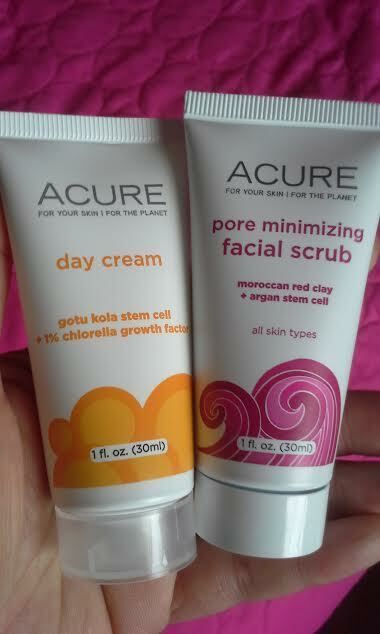 #HappyMothersDay to all of you celebrating this special weekend and today I want to share these really great organic skincare samples from Acure...one is a day cream and the other a facial scrub!! Although I don't need help in "minimizing pores" this facial scrub uses Moroccan Red Clay to help draw out impurities and gently scrub dead skin cells off my face (and it also makes a great body scrub too!)! Then this scrub nourishes with Argan stem cell and its great for all skin types, including my dry facial skin! This organic facial scrub is also without certain harsh or harmful ingredients plus its gluten-free, sulfate-free, paraben-free, and more!! And the day cream is wonderful on my gently cleansed skin in which I use both day and night on my face, neck, and chest areas! This cream nourishes with gotu kola stem cell and chlorella for my skin areas plus its also without certain harsh or harmful ingredients plus its gluten-free, sulfate-free, paraben-free, and more!! I was introduced to this brand thanks to both Target and Birchbox and very affordable to purchase!! I hope you get to try these and more from Acure (www.acureorganics.com)! !